This easy and delicious gingerbread fudge is the perfect Christmas season treat! This easy, homemade Gingerbread Fudge is the perfect festive recipe for the holidays. This simple, quick gingerbread fudge is the perfect Christmas sweet treat! It’s easy to make and also a great festive gift idea, stocking stuffer. It’s also perfect on a Christmas candy tray alongside homemade turtle candy and oreo fudge and an array of Christmas cookies. Already running as fast as you can this holiday season? Take up Gingy’s challenge and prove him wrong. 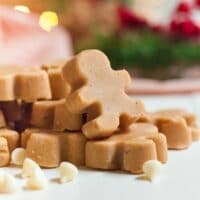 You can catch the Gingerbread Man with this easy Gingerbread Fudge Recipe! 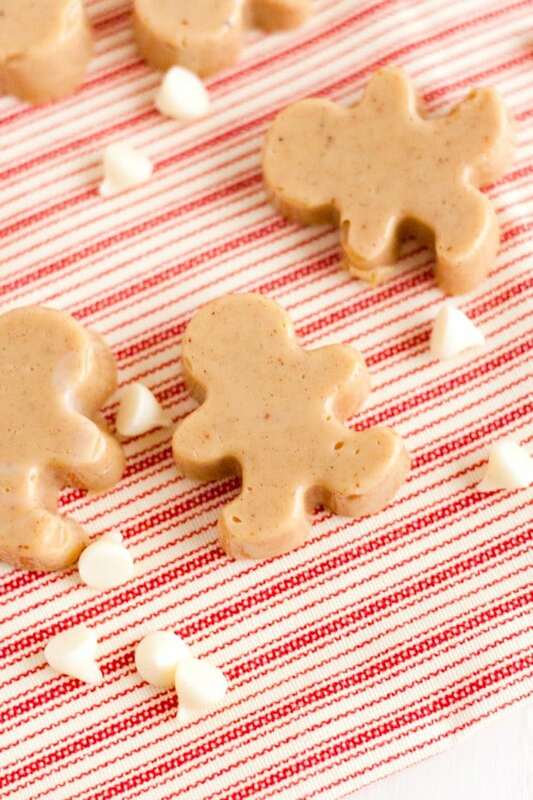 You’ll want to catch this Gingerbread Man when you see how sweetly simple and delicious Gingerbread Fudge is. This easy recipe for Gingerbread Jumbles — they have all the deliciousness of gingerbread without the time consuming task of cutouts! Get inspired for fun and creation with these gingerbread house decorating party ideas. If you know me, you know that I love everything about the Christmas season. I especially enjoy time spent in the kitchen, baking up yummy treats. Growing up, I always spent lots of time in the kitchen helping my grandmother and it’s a tradition I am happy to continue with my son. 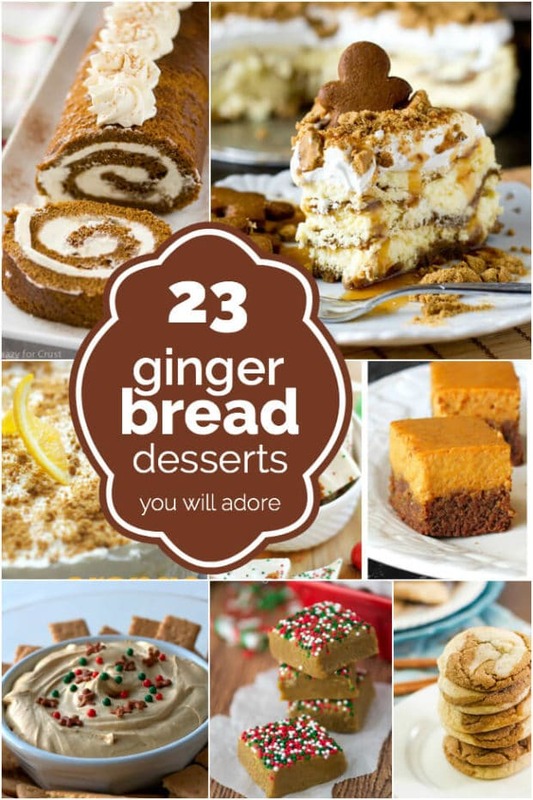 There’s no holiday flavor that entices more than gingerbread. The spicy aroma of ginger, cinnamon, nutmeg, and molasses is quite the olfactory come-on. As a little girl, I can remember baking gingerbread at my grandmother’s house. It’s still one of my favorite scents and instantly makes me think of Christmas. So of course this quick, sweet Christmas fudge is a treat I’m excited to make. Look at those darling little guys! 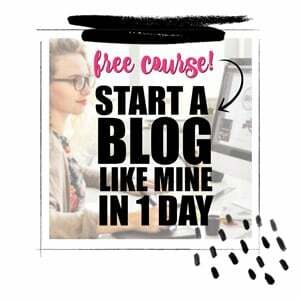 Amazon affiliate link –> You can grab the mold here! Of course, traditional gingerbread includes wheat but there are no grains in this recipe. If you know anyone who must avoid gluten but loves the gingerbread taste, bet they’d be glad to indulge in this luscious confection. This version is creamy, cute, and quick. Sweetened condensed milk and white chocolate combine to help make an amazing texture and taste for this white chocolate gingerbread fudge. A plate of these little guys looks adorable on a holiday party table. Box up a few as a party favor, gift them to friends or charm your family. 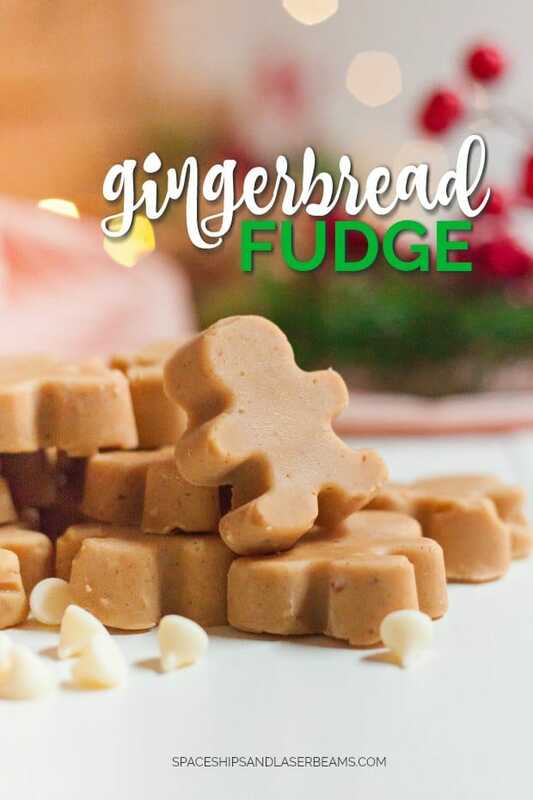 Let’s gather the items you’ll need to make this easy gingerbread fudge recipe! Another thing I love about this simple fudge recipe is that I always have these staples in my cupboard already. The Christmas season is busy enough already, so having a treat I can make at a moment’s notice for a quick gift or last minute guests is always a win. Now that you’ve got your ingredients, let’s begin! 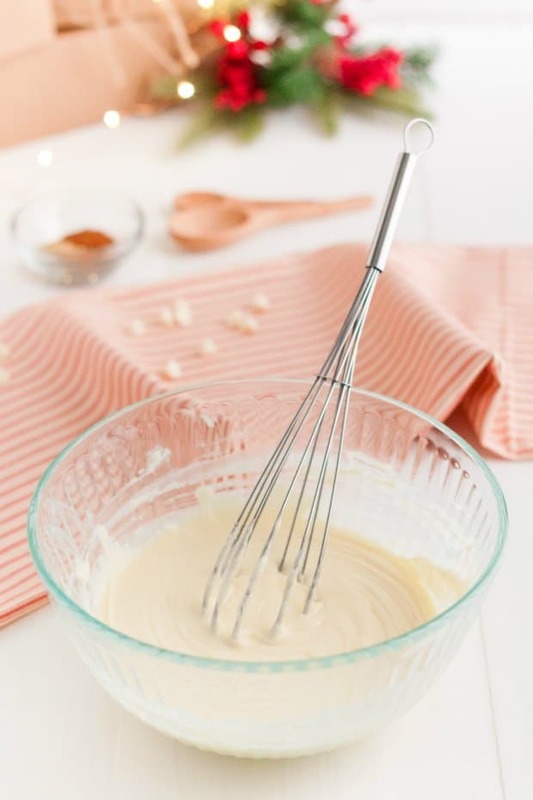 In microwave-safe bowl, combine white chocolate chips with sweetened condensed milk. Stir in molasses and then flavor with spices – adjust to your personal preference. 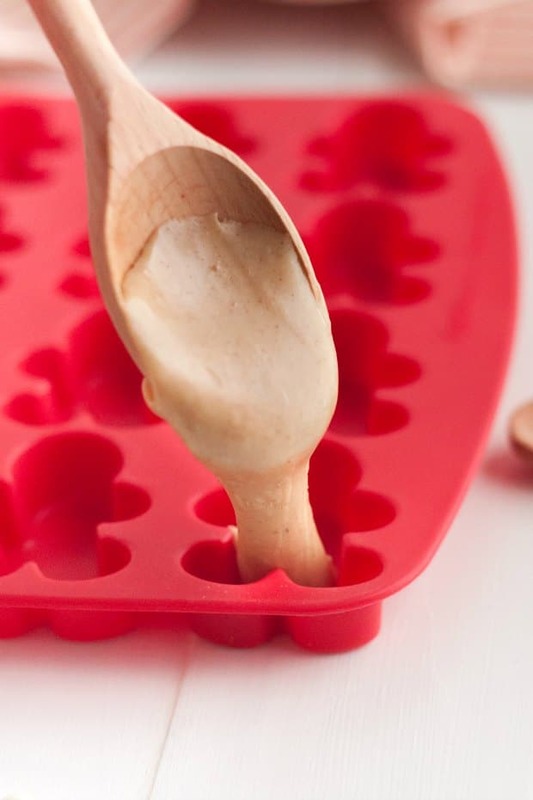 Spoon tablespoon-sized portions into your gingerbread man silicone tray, if using, or fold out into an oiled 9”x9″ cake pan. Press the fudge down with wet, clean hands to ensure it sets evenly, and then place in the refrigerator for 2 hours or overnight…if you can stand to wait. These look darling in little white take out containers with bows on them. A fun and easy gift idea for friends, family, teachers or coaches. I’ll be honest: we had to make a double batch the last time we made them because I knew my gang would want some to sample as well and they wouldn’t all make it into the gift boxes. It’s a good thing I did, because they were gobbled up quickly! You can find the silicone mold I used HERE. Stir in molasses and then flavor with spices - adjust to your personal preference. 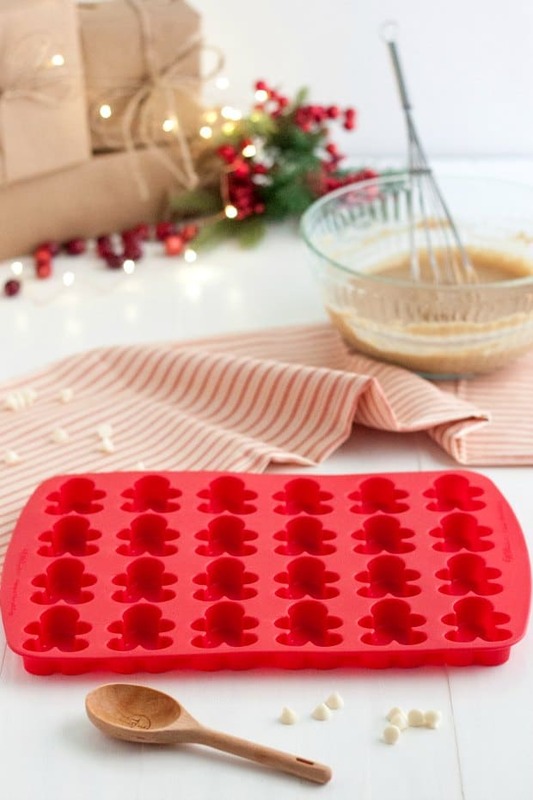 Spoon tablespoon-sized portions into your gingerbread man silicone tray, if using, or fold out into an oiled 9”x9" cake pan. Pop out of the tray - or cut into slices if using the cake pan - and serve or package for gifts. I’m obsessed with this sweet, Christmas treat! 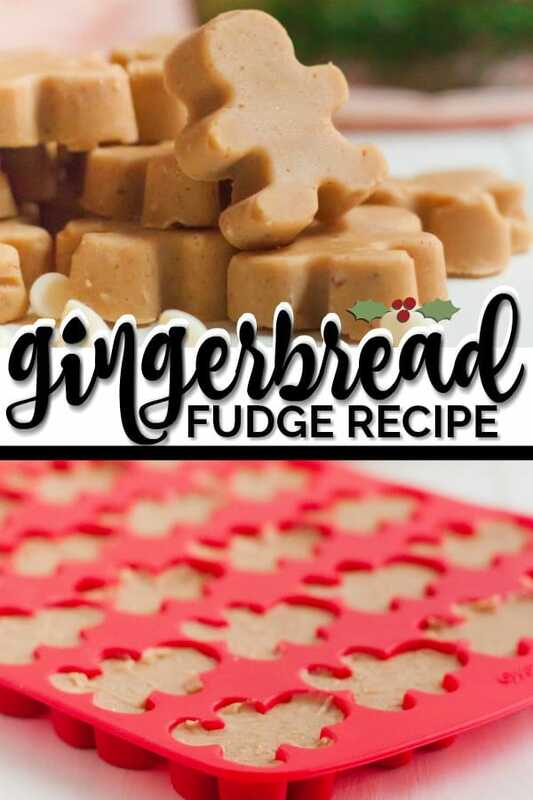 It’s the perfect fudge recipe and the gingerbread flavor is phenomenal! 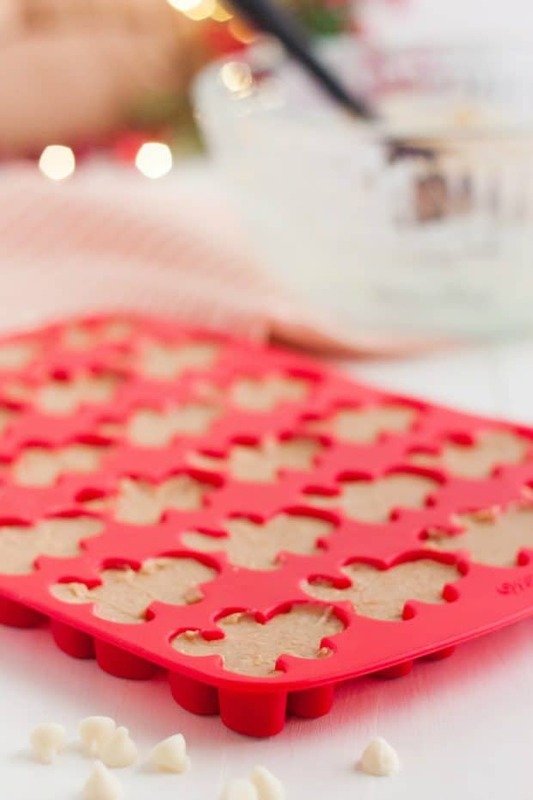 Thank you for this very easy recipe – I love gingerbread! Thank you for this very easy recipe!